The Cathedral Basilica of Ss Peter and Paul in Philadelphia will host a Solemn Mass for the feast of the Epiphany on the traditional date, January 6th, together with the blessing of gold, frankincense & myrrh, and the blessing of chalk. The proclamation of the movable feasts will also be sung. 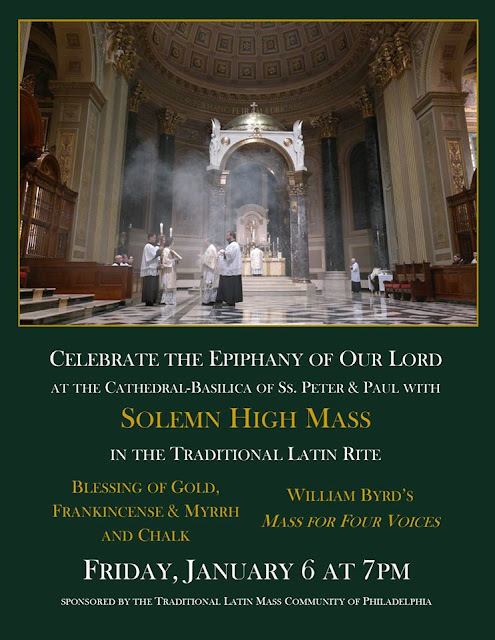 The Ordinary of the Mass will be the Mass for 4 Voices of William Byrd, with the motets Jesu, dulcis memoria and O Magnum Mysterium, both by Victoria. The church is located at 1723 Race St.; the ceremony will begin at 7.00 p.m.